Artful Affirmations: Tea Cup Tuesday Once Again! They are lovely, and I really appreciate the info!! Beautiful cups and saucers. 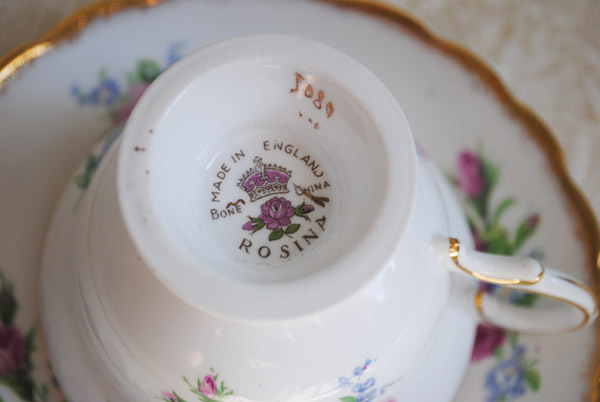 I'm not familar with Rosina china. It's really lovely. Such beautiful teacups and saucers! Both of these cups are beautiful. What gorgeous roses and gilding. They certainly would be perfect and proper for a ladies tea. Hi Terri, Your tea cups are really lovely - as always. I really enjoy stopping by to see you! Loved reading about your trip to Paris earlier too. Have a great week! 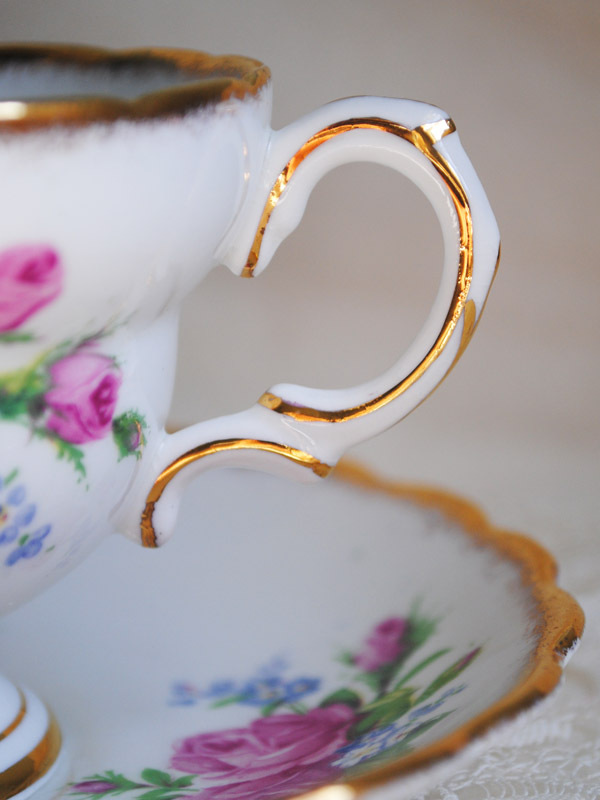 Gorgeous delicate little cups and saucers... love the scalloped edges and gold. Prrrrretty! 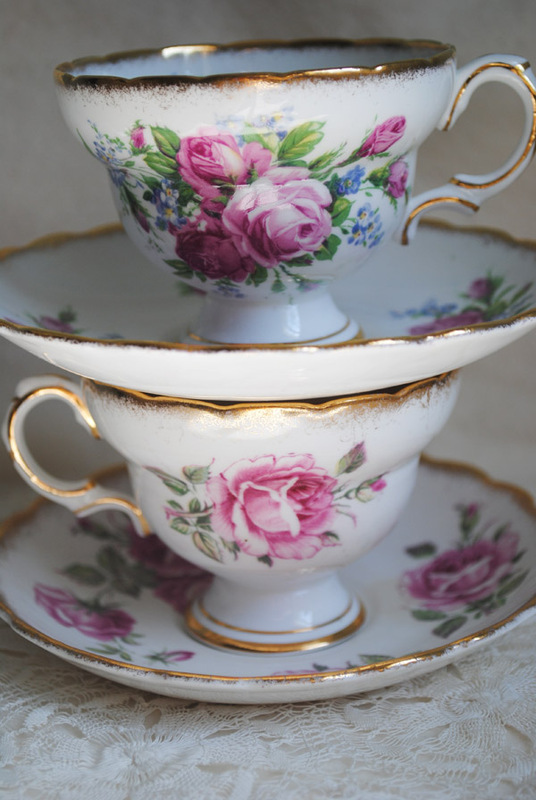 My, Terri, what gorgeous teacups! Love the roses and the gold gilding. Mine isn't nearly as scrumptious as yours this week! Thank you for sharing your pretties with us and enjoy your week. 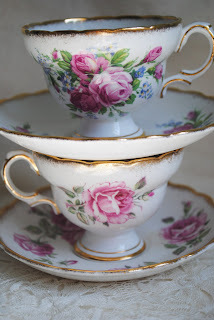 I love both of your rose tea cups..I can't believe there are so many patterns and makers I have never seen. Thank you for hosting! 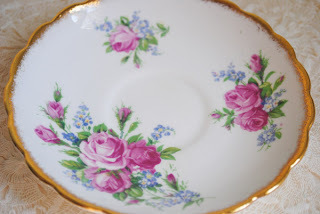 oh Terri, you always have beautiful teacups that made my heart pitty patter! love these cups a lot! Rosina is my fave too! I have few mix match set..
What beautiful cups. Thanks for hosting this fun blog party! I so enjoy your encyclopedic knowledge of teacups, thier makers and histories.., It is so interesting and informative! In answer to your query,(reference my recent Silken Purse blog post); I will have to go look up the information on the other teacups via checking out the makers info., on the bottom of my various teacups featured, in my china cabinet.., (I will go back and note this info., tomorrow). It is one of my absolute favorites! These are simply gorgeous little treasures! Love the way you always showcase the handles and have really gotten me to notice all the different styles and shapes!! Hi Terri! Beautiful pieces today for Tea Cup Tuesday! Love your blog. Thanks so much for hosting such a fun time! The rose teacups are beautiful, and I especially appreciate the addition of blue to any teacups. I have never heard of Rosina china before either, so as usual, I learn something new on Teacup Tuesday! 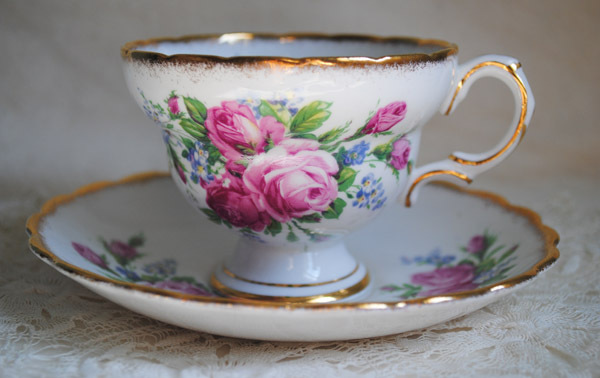 Good Morning Terri- Once again you have shared with us all such lovely teacups. I hope that you have a blessed day. Take care. I love the roses, the fluted saucers, the gold edges. Just lovely!!! Bonjour Terri - What a really lovely teacup! 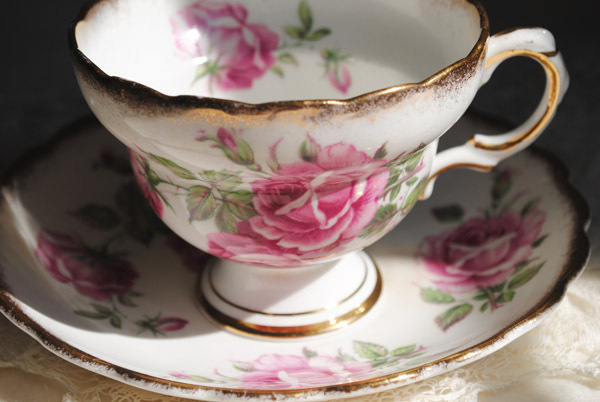 I love dainty pretty teacups like yours. Thanks for hosting another wonderful "partea". Sooo lovely Terri..and so beautiful! wow..i love the fake thumb rest..so cool! have a beautiful day and thanks for your lovely comment! Such delicate teacups. I can see why they would be favorites. The historical information is so interesting....Do you goggle for that? Some of my pictures are not clear of the stampings on the bottom. Any tips? Yours are always so clear. It is always a delight to see you teacups. Thank you for the tip...I will try your suggestion. Very lovely - I love tea cups with flowers on it. In fact, I think they are synonymous. Thanks for sharing and hosting. Hi, this is my first time joining in. I LOVE your teacups. So beautiful. And I love a beautifully designed handle. It just adds to the wonderful features of the cup. Thank you for visiting my blog today, and thank you for your kinds thoughts. I love your pretty rose cups, and the handles are very nice. I am rather picky about handles because I like them feel good when I use them. Your cups look like they have great handles for daily use. I also got a chance today to see your last week's post. I really like that blue tree cup you showed and told about. Blue trees...amazingly different! These are two stunning tea cups and both of them really speak to my heart!! Thanks so much for hosting this wonderful Tea Party and it is a pleasure to be part of it!! Thanks for the end of summer well wishes~ I love your cups. Just beautiful Terri, this cup is lovely. You have such a beautiful blog. I have been enjoying all your teacups. I want to thank you for the message you left for me. I appreciated it so much. It is wonderful that so many can understand my joy. You asked about my pictures. I always shoot on manual and meter the light on many different settings. Then I choose the one that is closest to what I see with my eye. I don't use a photo editing program (can't figure them out...LOL)I just ake many, many photos. I am SO late making the Teacup Tuesday rounds this week. I mean, here it is Thursday, and I'm just now visiting. Sorry for being so late. Your teacups are stunningly beautiful!! I love those gorgeous roses. I would definitely enjoy a ladies' tea from those teacups. Hope you're having a lovely, blessed week. I am just starting to collect and know so little. I am so sad to think of my mother's collection who went who knows where. The tea cups that many of you have shown are so beautiful and I am so glad for the opportunity to see and learn.